Climate Depot's Marc Morano: "Before 'global warming' caused sea level INCREASES, 'global warming' caused sea level DECREASES in 1987. 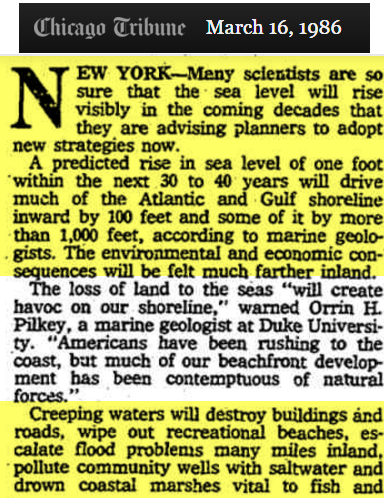 Now in 2016, a NASA study is claiming 'global warming' is causing a slowdown in sea level rise." Excerpt: Florida State University Geology Professor William Tanner: "Tanner plotted 4000 years of sea-level data on 5,000 years of climatological data published in last year's Encyclopedia of Climatology and found some interesting correlations. 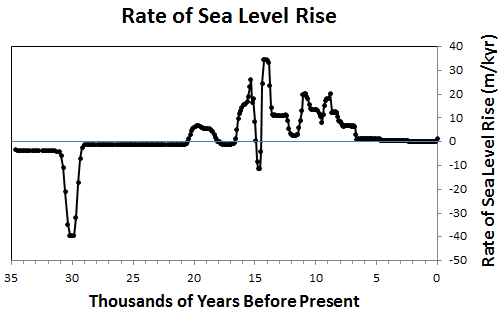 Every time the climate warmed a couple of degrees, the sea level went down. Every time the climate cooled a couple of degrees, the sea level went up. This happened four times, each cycle taking about 100 years, and spaced about 900 years apart." "He says sea level rise has been about six inches over the past century, and he now expects that to slow down and even reverse itself if humans continue warming the Earth." Settled Science: Global warming causes sea levels to rise — oops — fall, er slowdown? Whatever! NASA Study Concludes ‘Global Warming’ Is Actually Slowing Sea Level Rise – A new NASA study concludes global warming increases the amount of water stored underground which, in turn, slows the rate of sea level rise. At a time when scientists are worried about accelerating sea level rise, NASA scientist John Reager and his colleagues found an extra 3,200 gigatons of water was being stored by parched landscapes from 2002 to 2014, slowing sea level rise by 15 percent. More on Geologist Dr. William F. Tanner here. – William F. Tanner (1917-2000) Geologist – Of Tallahassee, Florida died on April 9, 2000. Tanner was an ASA fellow and a member of ASA’s Affil. of Christian Geologists. A prof. of geology at Florida State U. with emphasis on sedimentology, he was born in Milledgeville, Georgia in 1917. He holds a B.A. from Baylor University, an M.A. from Texas Technological College, and a Ph.D. from Oklahoma University, all in Geology. He has served as an Instructor at Oklahoma University, a visiting Professor of Geology at Florida State University, and Associate Professor and Professor of Geology at Florida State University. Since 1974 he has been Regents Professor. He has had geological experience in much of the U.S., mostly in the Southeast, Southwest, and Rocky Mountain areas,- maritime eastern Canada and Canadian Rockies,- Mexico, Panama, Colombia, Ecuador, Peru, Chile, Uruguay, various parts of Brazil, and Venezuela. His specialties within geology include sedimentology, sediment transport (including beach and river erosion), paleogeography and paleoclimatology, history of the atmosphere and petroleum geology. Dr. Tanner is Editor of “Coastal Research, ” Science Editor for the New Atlas of Florida, and Editor of six volumes on coastal sedimentology. He is the author of 275 technical papers. 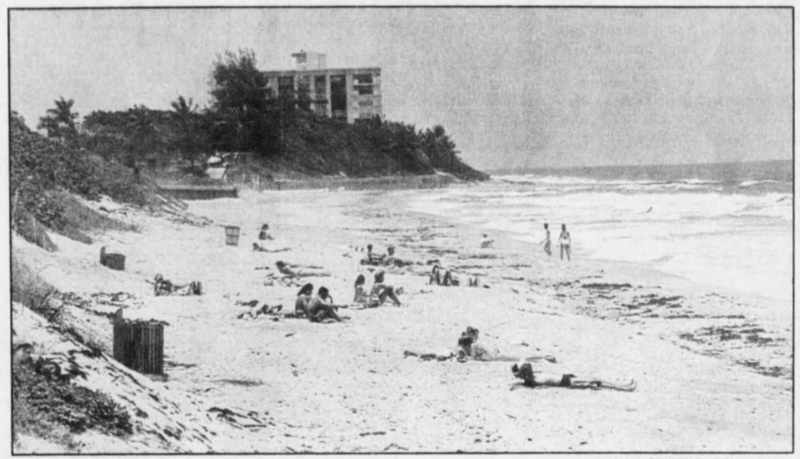 This picture of Boca Raton was in that issue of the paper. 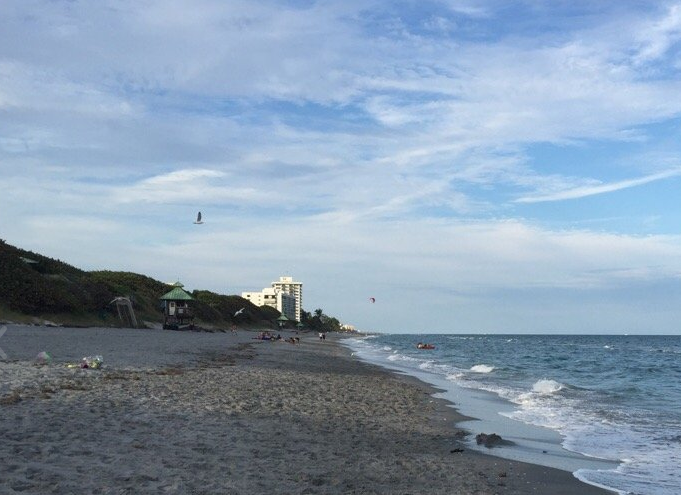 And this is what that beach looks like today. Nothing has changed. 1977: ROSS ICE SHELF, Antarctica-A huge portion of the Antarctic ice mass appears to be collapsing into the sea, a catastrophe that could raise the levels of the oceans by almost 20 feet. “We’re seeing the West ice sheet on its way out,” said Richard Cameron of the National Science Foundation. “It seems to be doing something completely different than the east ice sheet. It has nothing to do with a warmer climate, just the dynamics of unstable ice.”…”We’re doing about the most we can do right now to study the possible collapse of the west ice sheet,” said Dr. Richard Cameron, NSF program manager for glaciology. 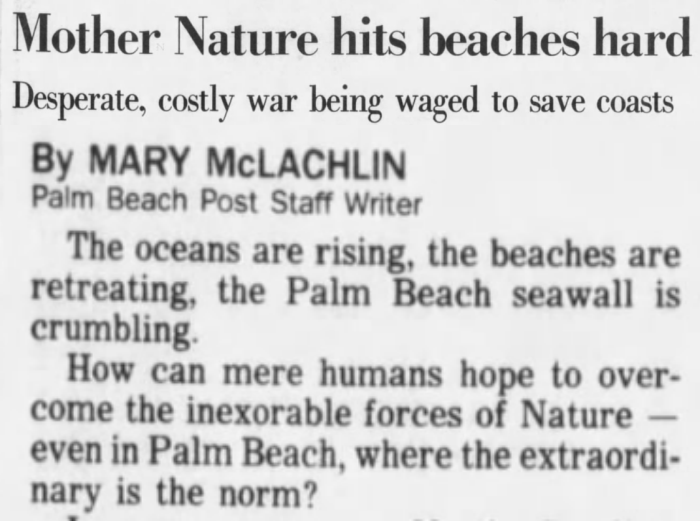 “It has become an area of concern because we could be on the brink of a rise in sea levels.” SUCH A RAPID rise is not unprecedented. It may have caused the Great Deluge described in the Old Testament. Flashback: Planet Healer Obama Calls It: In 2008, he declared his presidency would result in ‘the rise of the oceans beginning to slow’ — And By 2011, Sea Level Drops! Analysis of latest sea leel rise claims: Examination of the data from the paper, however, shows the range of proxy sea levels is approximately 10 meters, far too large to discern the tiny ~1.5 mm/yr sea level rise over the past 150 years. The authors instead assume from other published studies of tide gauge measurements that the ~1.5 mm/yr sea level rise over the past 150+ years began at that point in time. Other papers find sea levels rising only 1.1-1.3 mm/yr over the past 203 years, and without acceleration.